Australian law recognises that individuals have the right to protect the moral and economic interests arising from their creative works. Copyright is a form of intellectual property that protects a variety of literary, artistic, musical and dramatic endeavours as well as other things such as sound recordings and films. It is not ideas but their expression that are protected by copyright law. In Australia, copyright law is contained in the Copyright Act 1968 (the Act), and in court decisions that have interpreted the provisions of the Act. The Act is amended from time to time to keep the law up to date. The law gives owners of copyright exclusive rights to do certain things with their material. Copyright is intended to protect creative works from being used without the agreement of the owner and to provide an incentive for creators to continue to create new material. Copyright is a type of property that can be traded just like other types of property, such as real estate. However, it is different from tangible property in that it can be copied or otherwise used easily without the knowledge of the owner. Beside all that, when you get down to tin tacks, it's just UnAustralian. Don't you think? The following material in my books is Copyrighted and approval must be sought before copying any parts herewith and permission must be obtained from me before performing any works for monetary gain. 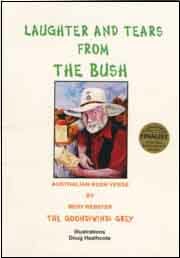 In 1995 I began compiling my first book of written bush verse, Tales of Uncle Jim, and then in 1996, bush poet, Neil McArthur encouraged me to have a go at performing my poems at the Bundy Mob's Bush Poets Muster. This was the beginning of my association with performance poetry and over the next four years I enjoyed a measure of success at various competitions held around the country. See ACHIEVEMENTS page. My goal was to be accepted by my peers as an original writer of rhyming verse as well as being a performer of bush verse and have them accepted as a form of entertainment. 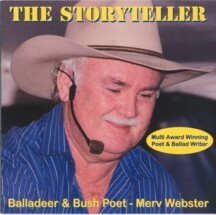 Since 2000, Chris and I have put together our own show of bush verse and yarns called, 'Laughter and Tears from the Bush', and presented it at various events around Australia. See our PERFORMANCE page for details and photographs. "I'll have a sip of beer my dear,"
The wife would always say. But would I have enough? Her friends thought I was tough. Yes while I'm on the go." When I was on the lounge. She started on the scrounge. Which sent me off my head. So drink some tea instead." Or even seem to care." Though asked me all the same. That had been very hot. I'd drunk the flamin' lot. "I'll have a sip my dear." "Left sitting on its own." And ran to claim the prize. She pleaded, "May I have a sip? I told you it was there." She whinged it wasn't fair. She thought it quite a sight. My lot was rather grim. Revenge was hers that day. Though heartfelt words tried hard to heal, a sadness still remained. I felt at loss with what to say, the words escaped my lips. Whose bridle she clutched in her hand, so little in the end. He showed the signs of foundered hooves, mate's gait was getting slow. But when we cornered all the mob, defiant they shot through. Desire to join the others though reflected in her stare. An outstretched arm was meant to calm and nullify her fears. And dashed past me with lightning speed, she meant to join her mate. When suddenly, her forefoot slipped, and caused the tragedy. Then concrete crushed her forehead bone, soft muzzle filled with blood. My daughter cried, "Please help her dad, please help my strawb'ry roan!" Then sent my girl to seek some help, to fetch the vet from town. The failing force within her friend, the situation grave. If she would lose her fav'rite mate, the waiting it was hell. My daughter spoke to reassure her love and life long bond. She thrashed and struggled all the more, each breath a muffled moan. Please let her go and be at peace, my love is not so blind." The fatal dose of sedative then quietly brought her end. And often sought to sit and talk by her young filly's grave. "It's better to have loved a friend, than had no friend at all." With his son and his darling wife Grace. His son Fred seemed to just disappear. Found no trace of their poor little dear. As the horses are harnessed and ready. 'Twas the outhouse that hid his young Freddy. "So the silly young bloke seems to fancy a smoke. Well I've just the right cure then for him." And the lazy lad’s future looked dim. While the slack was worked out of the chain. And both horses then took up the strain. Though soon ended up down on the floor. But he goaded his horses some more. With the paper and sawdust alight. Was one hell of a horrible sight. All the angels they must have been out. And the contents were scattered about. And the curing had come to a close. While the pong was quite strong on the nose. Our young Fred McPhee's work is hectic. As their place is now going septic. a loner and a bushman who'd a phobia of towns. within the month she’d left with him; this man she called ... her Bart. and Bart the artful lover ... well ... he’d lost his luring charm. so for her little daughter's sake, this ploy was paramount. no sparkle filled this mother's eyes; salt water welled instead. while Sarah's isolation slowly sent the girl insane. and Sarah's soul just pined away till slowly she grew ill.
the silence ... like a deathly calm that comes before the storm. Bart's face became so ghostly white, his eyes were filled with fear. the family he'd never known ... his children and his wife. and where Bart went ... well no one cared ... not even to this day. please think of Sarah and her kids ... you saw the life they led. This tale was related to me by an old friend. Apparently it took place in Northern Queensland, but the names have been changed. My wife when she read the poem asked what eventually happened to Bart. My reply was, “No one really seemed to care. Sadly, there have been lots of Sarah's in this life. To their memories. 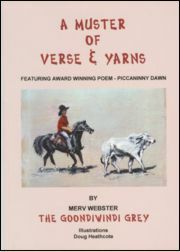 Sarah won the serious section for written verse at The Australian Bush Poetry Championships atYarrawonga-Mulwala in 1999. DANIELLE'S LAMB GUNSYND - THE GOONDIWINDI GREY THE PENMAN OF THE PLAINS WHERE DO YOU WANT TO LIVE? To share with folk my love of verse and flog me tapes and books. And being air-conditioned like Grace Bros. saved the day. When to my right I heard a ring - a flam'in mobile phone. Some voice then answered, "Campware here, oh hello Miss McBride." When stone the crows - another ring - but from my left hand side. A woman's voice said, "Hosiery, Miss Makim, how’d you do,"
And there I was perched on the throne, caught right between the two. In fact I had to come to grips with why I'd come in here. Which had my mind a wee bit tossed, confusion reigned supreme. "Two padded bras," Miss Makim asked, "They both must be the same." "But room for three," campware replied, “With self supporting frame." "Your pref'rence is convertible and satin finish too." "Though shade cloth inserts are a must, to let a breeze blow through." "And do we have some knickers which would match the bras - in black?" "Of course they’ve got the bottoms in and zip up front and back." "We have a range that slip up quick and come down just as fast." Transacting business in the loo, can really be a drain. When spare me days, 'twas nothing there, but cardboard roll and frame. When suddenly it crossed my mind - I'd brought my mobile phone. Then figured I'd ring toiletry, they'd have some rolls no doubt. But when I punched the numbers in I heard a ring near by. That's strange, I thought, then heard a voice say, "Toiletry, it's Di." I'm in your loo and out of rolls so could you bring some more." You see I'm only two doors down and out of paper too." 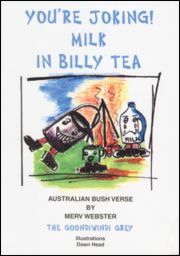 While I was sitting outside Grace Bros. in Peel street Tamworth promoting my new book and our tape, both of which had made the Bush Laureate Awards, I was intent on writing a poem. I pondered on what to write about when from among all the noise and confusion I came up with the above. Must have been the combination of the Panamax and the Coke! Inviting me to ... rise my son! Come greet another dawn! Already townsfolk bustled by ... I bid them... "How’d you do!" Then sat upon my fav'rite bench with clothes still wet from dew. It's murder, theft and overdose! The end of some soul’s fight! With notions of new freedoms ... for the bush was surely dead. With life styles going nowhere and their futures down dead ends. But selfish desperation made these facets hard to see. And watched her tie the bouquets to the bench with yellow lace. My presence of no consequence, I heard her gently say. "How are you John and you too Mark, 'tis such a lovely day? I miss you two... you both know that... this year has gone so fast. I'm doing rather nicely John, I've found a flat at last." And when I need a few things love, I don't mind walking down." And how you fought the phantoms of that war you left behind. You lost your fight on this park bench ... alone, without a friend." I lost him John; he hit the streets where heroin was rife." Some kids were dealing in the park, or so the paper said. They found our Mark upon this bench. He too had lost the fight." Until this time next year my loves, when we will meet ag'en." Then took a step, but paused again, to look me in the eye. Her final words. "Go home my son. You're much too young to die." Each suburb 'round old Sydney town had heard the newsboy's cry. "It's murder, bloody, murder folks, it's ten who've come to grief!" And even folk from Redfern way would cringe in disbelief. For all his victims up till now were barbers of a kind. The weapon found at ev'ry scene was razor sharp I fear. And long hair was a common thing on ev'ry Sydney cop. The barber's union secret'ry got calls of, "Help us please!" While rumour has it Stefan's left and ducked off overseas. Profilers sat and scratched their heads relying on their wiles. Was jealousy the motive then to thin the barbers ranks? Or were the killings sweet revenge, a payback for their pranks. Some facial hair of quite some length, the kind you find on males. Revealing its genetic code to solve the mystery. The facial hair was known to them, a rather unique strain. Some barber tried to cut his throat and caused a violent scrap. And records showed the victim was from up at Ironbark. And took a sample from the beard of ev'ry youth and spouse. It was the grandson of the man those many years ago. A livid mark from ear to ear just as they all had feared. Of ev'ry male his granddad bore, according to his kind. That Sydney had some arsonist now burning bike shops down. Detectives say they've found a note which has them baffled still. 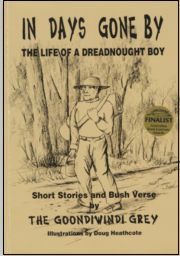 "My granddad hailed from Eaglehawk and suffered from a spill"
Most of us were brought up on the verses of Banjo Paterson and enjoyed the humorous tales of 'The Man From Ironbark' and 'Mulga Bill's Bicycle'. Today's world is a very different place and the irony of it all is that the above scenario could possibly happen. Scary, eh! 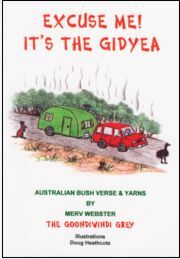 Winning poem in the 2003 Australian Bush Poetry's Associations Written Competition. Apparently while on his shift from midnight through till dawn. Disclosed they'd rolled some homeless bloke, sometime just after dark. Observed some pretty callous things, but this left me in tears. And through his snow white hair and beard was clotted, crimson blood. The Constable looked up and said, "There fam'ly we can call? For surely someone knows him Sarge. You know the bloke at all?" "He's know 'round here as Stumpy lad, been here a year or two. Was captain of the football team, a sportsman of renown. They called conscripts for Vietnam, which saw him go to war." Confusing, cruel, and futile acts some failed to leave behind. Together with the stump you see attached below his knee. A life spent fighting guilt and fear his mind could not subdue. But in the end she lost the fight as Stumpy left again." But all the town saw Stumpy Shore, a harmless poor old bloke. Who cared for her through all those years until she passed away. So in his mind he held no grudge against old Stumpy Shore." He saved a lad from drowning as he'd dived onto some rocks. Ironical, I guess eh lad, that Stumpy should save him." And judged the bloke on what I saw, but this has left me numb. The facts are mighty sob'ring Sarge and now I feel real bad. You reckon we can find his son?" ... "You're talking to him lad." 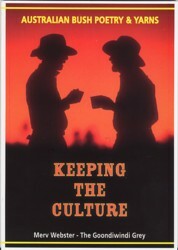 The experiences of integration back into society by many of Australia's returned soldiers were often only known by close family members, if that. Whether the result of today's open-mindedness, the plight of veterans lives after Vietnam has been more of an open book. Their stories are quite sobering, touching the lives of both city and country folk. Lest we forget. The colour of my hair was black, my eyes were greyish blue. And Ellen was my name in life, one of eleven kin. Down under to Port Phillip, where he planned to relocate. Were precious times to sing and roam, naive to life's cruel ills. For there I met an Irishman, who swept me off my feet. And when my parents disapproved; we then eloped instead. It's tough to be a Kelly, but a Kelly, that I am. My first child was sweet Mary Jane we baptised at Kilmore. We had her, then we lost her; we had our child no more. And made enough by Christmas time to come on home to me. 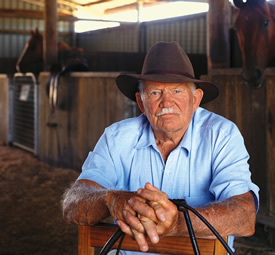 Then Red bought land at Beveridge, a whole new life began. For our son Edward joined the world and I was one proud wife. But always had a home for us and that was love enough. Showed such a certain will to live she was so much like me. And here we'd build our future dreams for which I prayed aloud. As charges laid against our clans were now on the increase. But hard times and the alcohol would take its toll as well. Though in that year I Iost my Red; he was but forty-five. Some said my Red had failed in life, but that is just not true. He was my husband whom I loved, his children loved him too. But widowhood and poverty were hard to reconcile. Red's sister Anne and I then clashed and what was the result? The Magistrate at Avenel would fine me for assault. To join my two grass-widow aunts in Greta further North. And so he did from that time on; God bless the poor child's soul. James Kelly burnt the darn thing down, 'cause he'd become irate. Then found a home near Greta on Eleven Mile Creek Road. And board from thirsty travellers would help us all get by. Then two months later gained my lease and things were looking fine. Another blow which hit me hard and left me in dismay. But came home dirty, poor and lean devoid of any wealth. And some felt he betrayed old Pow'r, but Ned would never sing. And sent my Ned to Beechworth goal on two occasions now. Though never kept his promises and his child Ellen died. One Earnest Flood, the Constable, found Annie easy prey. As Annie's unexpected death left us in disbelief. While Ned was sent to Pentridge jail to serve the term still left. Around that time a stranger came, who'd share part of my life. George King from California and I'd become his wife. And all the joy now in my life I had not counted on. And had come home a diff'rent lad and planned to keep the peace. Both George and I we paid our way and got by well enough. Were quite intent to bring us down and that we Kelly's knew. Would take the bait, retaliate and give them merry hell. My Jim came home with two new friends; young Sherritt and Joe Byrne. Two boy's who would befriend my Ned as I was soon to learn. And George would walk out of my life and leave me there with child. 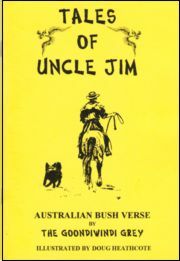 Then once again Jim was in jail, horse theft they say the crime. What lay ahead would change our lives; Fitzpatrick's little show. Which caused my Ned and Dan to flee and I to jail that day. By handing down a three year term on that October morn. But now the law saw sweet revenge and just ignored their plea. And sensed my boys they would play up, there would be murder now. And sensed his time left here on earth was dwindling rather fast. But once back in my dreary cell I cried and cried and cried. I can't condone the things they did, but life for them was hell. Though justice was denied to us so many, many times. Though things at home were volatile and hatreds had not ceased. And in good time I came to see the past was history. 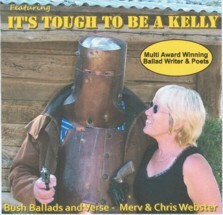 As treatment t'ward the Kelly clan was strongly criticised. Though came on home a better man, God bless his weary soul. Poor Maggie died in ninety-six, my Jim looked after me. Though Jim and I would raise her kids; the least that we could do. My mind goes back to bygone days, which ends up bringing tears. To let the poet tell my tale ... my wish and last desire. 'Twas tough to be a Kelly, but a Kelly, that I was. Being of Irish descent, I have always felt for the plight of the battler and though many stories have highlighted thestruggle of Ned's life, I felt it was time to let his mum have a word. My tribute to a pioneering lady, who found not only the physical and economic nature of the colony a struggle, but also the social, justice and class structures as well. Whose voters were in grip of drought and rather discontent. In hope the hail would be dispelled and condensation form. If only Queensland's government were willing to help out. Of testing out the vortex guns in their vicinity. Provided Wragge's known expertise would guide them through this phase. To travel west to give advice; then certainly he ought. Allowing for the mortar blast to make a grand escape. Two feet three inches 'cross the mouth; nine inches at its end. And stood some twenty inches high above a wooden base. 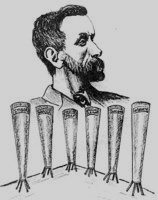 While powder was provided free by Philp for each gun's breech. Like Stiger, Philp and Leahy and Suschnig, Harvey, Wragge. And if the rains delayed much more they simply wouldn't last. Requesting where subscriptions went. Where were the guns and Wragge? And rumour had it Wragge would come within a week or two. Prepared to share with folk out there his expertise and skill. And thought the Mayor discourteous and felt somewhat let down. Escorted Wragge in search of sites where he could fire the guns. While Spencer's and the Rifle Range were jotted down as well. Or many other folk it seemed, which Wragge thought quite unfair. Though helped erect the vortex guns, then set off on his way. Insisting his discourteousness belied his public trust. But desperate to break the drought the townsfolk tried again. And still the rains eluded them much to the folks dismay. While Wragge blamed failure to comply to guidelines set by him. Berating him as he'd designed the guns to dispel hail. But towns like good old Charleville have stood up pretty well. Is blokes like that are just like things which hang from sheep's behinds. In nineteen hundred and two, Queensland was in the grip of severe drought when Clement Wragge suggested he could use Stiger Vortex guns to induce rain. The above poem tells the story of what took place. In 1947, some forty five years after the event, one of the guns was retrieved and fired during Charleville's Centenary celebrations and later again when the C.S.I.R.O. were conducting experiments in seeding clouds. One of the guns survives to this day and can be seen standing near the tourist information centre. WHAT DO I TELL MY CHILDREN? WHO WILL SING THEIR PRAISES? WHAT’S WRONG WITH RYME AND METER MATE? When I heard the music jingle on my mobile telephone. "It's the Channel seven news room Grey, we need to have a word. So you're bound to be a natural reporting local news. And we're sure that you can wing it son. We want you to come in." So I asked when did they need me like. A voice cried, "Mate today." 'Cause I had to make some changes to my image, that's for sure. But I'll leave some grey tips showing; hell they'll look blonde sure enough. And I'll have to brush some white out on to show me pearly whites. Though I'll take the hat and whiskers off, they're not young Robby's style. He might put me on a winner and I'll take a flamin' cruise. Scott or Bill would be much simpler, but they just don't sound the same. Well I'm ready as I'll ever be. I'd best be on my way. Hey! The news at six on seven, with The Goondiwindi Grey. When the jingle on my mobile rang. I thought … who's calling now? So I stopped and grabbed it from my hip and said real cool, "G'day"
When that voice from channel seven had the following to say. "Grey! I'm glad we caught you just in time. Young Broughy's rung old son. He was down a number on the draw and so he never won. So Grey thanks for helping out old mate, perhaps another time." Darn. I guess it's back to old bush verse and spruiking ruddy rhyme. And we stayed in good old Hebel so we didn’t miss the game. Who were cheering on the Aussies and envisioned victory. But the Pommes were hanging in there and encouraged by the crowd. And a further twenty minutes was now on the cards for sure. And the menace that we feared the most was .. hey, I think you know. Yes the Pommey’s secret weapon, what a truly awesome sight. Johnny Wilkinson and his right boot that won the game that night. ‘Cause they flogged the poor great granddad of my gentle, poor, old mum. Was among the flaming spectators that cheered the pommes as well. When I felt the call a nature that was painful and quite cruel. When I felt a strange sensation like the presence of someone. And it really was quite scary; still I didn’t stop to chat. There’s a sort of royal presence in your gents that’s really queer. She then smiled as she expressed to me, "Prince Harry used the loo. He’d dropped in from Tooloombilla and had spent a penny too. So I guess it was his presence mate, as far as I can tell." I released my pent-up feelings and expressed them just the same. "I don’t care if he is royalty, it’s no excuse I fear. As replacing empty dunny rolls is etiquette out here!" I was watching the news one night when a story on how Prince Harry, who had been working on Tooloombilla Station west of Injune, came into town and had excited the locals when he called in at the local roadhouse and had visited the Loo there. This was about the time of the World Cup and having been done over by Johnny Wilkinson’s boot I was in a, cut down the tall poppy mood, and young Harry seemed a good candidate. A ringer who for sixty years knew nothing but hard work. So slip down to the city man and have a flamin' break!" The old bloke wasn't all that fussed, but Mal said, "No buts, son. You take your swag and old blue too and have a bit of fun." And Blue marked every light pole in Kings Cross that he could find. So Jacko decked him on the spot. He didn't mind a bit. Which sent the old blue cattle dog completely off his brain. And both were feeling pretty good. They didn't might a bout. Where Jacko thought the blokes all dressed a little bit bizarre. Some blokes were slipping other blokes a rather tidy sum. "You silly great big sausage dear. We're gay here, can't you tell." "Who wouldn't be?" smiled Jacko "I'd be rather chuffed as well." And hinted he could eat a horse and chase the rider too. That oriental tucker place big Mal said they should try. And tried to read the menu, but the lingo had him beat. So reasoned why not gesture to the little bloke instead. Convinced the confused waiter would now know just what to do. And Jacko thought ... he's got it ... and responded with a smile. And Jacko thought ... that's service ... and he thought it rather cute. I wonder what he'll give old Blue; he does deserve a treat. A change I guess from biscuits and a chunk of old corned meat. And entertained himself by playing spoons upon his knee. He'd never eaten Thai before or tucker of that kind. A meat dish cooked in spices and done in the old Thai way. He lay it on the table and he said "You like it chum?" But Jacko look dumbfounded and his body went quite numb. And all the boys from back of Bourke they would have heard his cries. Old Blue his only friend in life dished up upon a plate. And ended up a nervous wreck and with a weakened heart. But Jackos never eaten meat from that day down to this. And we're passionate 'bout our footy and we love a Bundy rum. We're as ridgy didge as vegemite. No! Mightymight leastways. We get green and gold malaria at least twice every week. And the truth be known ... we've got it now ... right as we flamin' speak. When we see our nations coat of arms we feel a sense of pride. Well ... that was until we went outback. These days we cringe and hide. And we thought we'd tour Australia. It was bound to be a hoot. Both those critters on our coat of arms ... attacked us then and there. Was a whopping great big Kangaroo and old man Emu too. And the emu hit the windscreen and was dumped upon our laps. As he started kicking madly to escape from out the car. While my manhood stood protected by a pocket full of coin. 'Cause he lashed out at her torso that was bloodied, cut and bruised. Was now spread throughout the vehicle as we fought that deadly fray. That bird shredded the upholstery as he kicked with all his might. He then squeezed on out the window and he headed for the bush. As we scrambled from our four-wheel drive both still a little dazed. And we climbed inside to find the kit both feeling rather sore. He had clipped our brand new four-wheel drive and hurtled through the air. It had landed in the caravan through awning, glass and all. When the scream from my old lady triggered something in its head. And he shredded my new Levis and then made a quick retreat. But instead his big tail hit me with excruciating pain. And they jumped around together as they grabbed each other's neck. While the missus she kept screaming, "I can't take no flamin' more!" Spilled outside onto the roadway where it bolted for its life. And I must confess our torsos they were not a pretty sight. We then sat and drank the rum we had; we needed a stiff drink. And we headed back for Melbourne where we both sought out a shrink. And we watch the good old tele when we want to go outback. But we cringe when we're confronted by our nations coat of arms. But my craziest ride was November last year. And he gave me the ride. I was proud as can be. But with Jenny Craig's help I'd be right for the race. Till they gave me pink silks and a purple bow tie. Just to help me erase how I looked like a dill. When your mongrel bred mount goes and stands on your toe. And despite the catcalls from me smart jockey mates. Was when Thong Classic jumped would he leave me behind? But I'd prove in the straight they were up against class. When this poncy young jockey bloke puckered his lips. And a divot of turf hit him smack in the face. And Thong Classic sensed too he had something to prove. And I knew I was in for one hell of a ride. While McArthur cried, "Ride, Pinky ride you great berk." But a length from the finish ... I felt my foot slip. When a voice from the dark cried, "You're flaming insane!" My poor wife on the bed looking terribly sore. And was bowed in the back lying tummy side down. While the screams I had heard were from pain she had felt. And to stave off divorce was a hell of a fight. And I sleep with darn hobbles strapped round both me knees. To Sydney in Australia and a brand new neighborhood. And that is where she raised me like and by the way I'm Nell. So planned on one last visit back to England late last year. She stayed there for three months or more with her dear cousin Em. And emailed every Friday without fail 'round 8 p.m.
Then suddenly the emails stopped, we heard from her no more. Then late last week the mailman dropped a package at our door. But when we saw the contents it sure shook us for a spell. And that was all, no, nothing else, which stunned our family group. And she's sent us all a sample so that we could taste it too. But after eating half of it we had to tip it out. Could recommend that soup from hell to all our Aussie clan. Again it was from England, so we read it straight away. It was a note from cousin Em and this is what she said. "Regret to have to tell you folk your dear old Gran is dead. Gran told me her last wishes and so this is what has past. And save the legal rigmarole most other folk go through. Forgot to put this letter in, though sent it off next day. My heart goes out to all of you; your Gran was such a gem. And please forgive the mix-up folks. Yours truly. Cousin Em." I was feeling down, despondent, though I could not figure why. Hell... perhaps it was the weather and the fact that things were dry. bringing melancholy moments when one's soul cannot find peace. and I glanced down at my laptop; it was from a mate I knew. who would often send me stories that someone had sent his way. there were folk who faced much crueller tests and tears welled in my eyes. I have taught piano lessons to young children by the score. there were sadly some among them who were challenged musically. and the lad was now eleven ... much too old I thought to come. and those haunting words still linger to this day within my head. Robby had no tone or rhythm and this fact he could not hide. He just lacked inborn ability, but still the lad he tried. and I'd never met her personally in any way so far. Then one day Rob never came again. I guessed he'd just moved on. Though I must admit I felt at ease now that the lad was gone. and then several weeks on down the track I sent some flyers out. where the parents, friends and relatives could see them in full flight. but I told him it's impossible, he did not qualify. You have not attended lessons, so it really wasn't fair. I don't know how he persuaded me, but Robby got his way. and that way I'd salvage self-esteem or bluntly ... save my pride. but the sight of his appearance ... well, it truly left me vexed. and it looked like an eggbeater had been through it I confess. he would play Mozart's Concerto in C Major for the crowd. and I know that Mozart would have been amazed at what he saw. and the crowd just stood applauding while I had the biggest smile. And he spoke into the microphone and gave his proud reply. and she passed away this morning Miss. I had to play my best. that one day she'd hear me playing and I know she heard tonight." And I can't say the face it was mine. And most bush folk admired you God knows. For you taught us the value of pride. R.M Williams ... A Man Who Had Tried. Was a blow, which brought home a few tears. And your trade mark the boots you designed. As no better a boot could you find. And we've taken your wise ways to heart. If one has the desire from the start. You yourself played the role of bush bard. If I polish these boots really hard. But no, the words rang in my head. 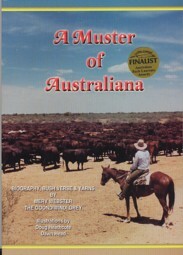 Slim Dusty's passed away. I knew the old bloke had been crook and not that well of late. Still, legends live forever … though … it seems I'm wrong old mate. Though sung them in the ballad style backed by a guitar stroke. And most of us we shed a tear when poor old Trumby died. The spirit of your ballads, mate, ring through life's memories halls. I never cried for Elvis, but I shed a tear for Slim. And entertained a lot of folk and made them laugh or cry. And kept alive the sentiments of yesterday's bush bards. A myriad of campfires echoed tunes that bore your brand. The Pub With No Beer, Duncan; just two that come to hand. You made us feel Australian with a sense of wrong and right. The city bloke, the bushy, whether brindle, black or white. And old St Andrews echoed to a melody of songs. And no one lives forever, but the memories will not end. A father, grandad, soul mate, of that I am quite sure. 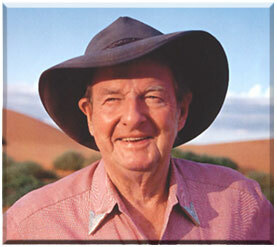 The final curtain's fallen on the last Slim Dusty show. And his eyes were cast down at the mound. Now displaced by the peace he had found. He'd fulfilled as he'd promised he would. Lay together as he'd deemed they should. But the lad was so wilful and game. He'd only gone down to the two mile that day. Still he failed to return all the same. And for days rode the ranges in hope. Till her frail frame could no longer cope. And he vowed to his God and to her. Till the ranges declared where they were. For the bones 'neath the ironbark tree. And he searched every gully and ridge. He forged on with his bold pilgrimage. But they sensed the man's presence and fled. The old man set his course straight ahead. Where a column of smoke filled the sky. And the hot winds forced flames to soar high. In the bowels of a cave and gave prayer. Had him gasping and choking for air. And the fire front raced still further south. To the gully of ironbarks below. And beneath it there laid a charred frame. Though it caused him to stop all the same. The singed hide was chestnut and that of a mare. Yes, the quarry he'd sought for so long. And a magpie burst forth into song. Lay the bones of his daughter's lost son. But the old man sensed no one had won. And the horse showed approval and neighed. And a calm inner peace now pervaded the man. He'd fulfilled both the vows he had made.